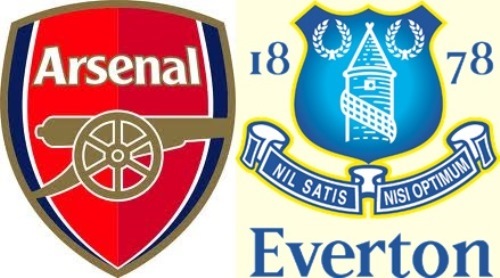 Premier League Preview for Arsenal v Everton along with Predictions for the matches on week 33 of the EPL. Follow up each match with results and video highlights posted later in the week. You can also check out the weekly EPL TV Schedule. Back when these two teams met on November 28 they managed a 1-1 draw at Goodison Park with Fellaini and Walcott each scoring. Both players should also be available for Tuesday’s match. This is a match that is huge for both clubs and could go a long way in determining the outcome of European places in the Premier League Table. As the table stands now Arsenal sit in third place on 59 points while Everton are 4 points behind with 55 points in sixth place. In between them are Chelsea in fourth and Tottenham Hotspur in fifth, both level on 58 points (though Chelsea does have a game in hand). It has seemed that David Moyes tends to go with a more negative, defensive setup when facing bigger sides with some mixed results having gone 3-2-2 against top five opponents this year. It will be interesting to see what he will do on Tuesday against a rather in-form Arsenal side. I do think it would be nice to see them go for it, after all, they do need the win more than Arsenal. Arsenal were not looking like getting anything out of their match against Norwich on Saturday until they got the penalty. This seemed to take the edge off of the Norwich defense. You could say Arsenal were lucky since Norwich should have had a two goal lead, and the second Arsenal goal did have a foul in the buildup. Either way, they got a crucial come from behind win that will give them more confidence. For Tuesday’s EPL clash my prediction is for a draw. It could have a few goals in it as well considering the form of the two teams. Depending on which team gets the first goal, it could become a very interesting match.